The history of the Temple in Jerusalem is firmly embedded in the narrative of the Israelite people and started much earlier than the actual building around 964 BC. The first official place of worship was the Tabernacle, a makeshift sanctuary built around the Arc. The structure took a central stage during the exodus of Egypt under the leadership of Moses and symbolized the unity of God and his chosen people. The blueprint of its layout pointed directly to the more definitive Temple building, as it was later constructed in Jerusalem. The Tabernacle consisted of ten pieces of linen tent cloth or curtains, stitched together in two rows of five and tied to the ground by two times fifty loops – as described in the Book Exodus, chapter 26. Eleven curtains covered this tent-like structure. Further details of its interior, the spatial dimensions and the architectonic setting were given in the same way as Ezekiel did for the Temple in Jerusalem (Ezekiel, chapter 40). These quasi-accurate details were eagerly used by those, who searched for a visualization of the historic places of worship (fig. 153). Fig. 153 – An engraving of the Tabernacle positioned in a double square amidst the Israelites’ tents, as given by Jacob Judah Aryah Leon Templo (1603 – after 1675). The names of the twelve tribes – and their actual numbers! – are given in an explanation on the left-hand side. The representation is pure fantasy, but the illustration is executed with accuracy and credibility. The use of the four-fold symmetry is characteristic of the spirit of the time (1654). Its numerological significance enlarged the power of the material visibility, which had reached a pinnacle in the cultural consciousness. A Jewish rabbi named Jacob Judah (Aryah Leon Templo), born in Hamburg in 1603, took to this task and drew up a plan of Solomon’s Temple, which was exhibited before Charles II of England. The ‘Retrato del Templo de Selomoh’ was printed in Middelburg in 1642 and translated in Dutch in the same year. Translations in other languages followed, including one in Hebrew called ‘Tabnit Hekal’, done by the rabbi himself in 1650. Three years earlier (in 1647) he wrote a description of Moses’ tabernacle in Dutch, which was published under the title ‘Retrato del Tabernaculo de Moseh’ in Amsterdam in 1654. A distinct four-fold symmetry is present, with the twelve tribes of Israel (4 x 3) positioned around a square, with the tabernacle in an inner square. The Temple in Jerusalem is of special interest to the present investigation because its history reflects certain opinions within Christianity towards building in general. 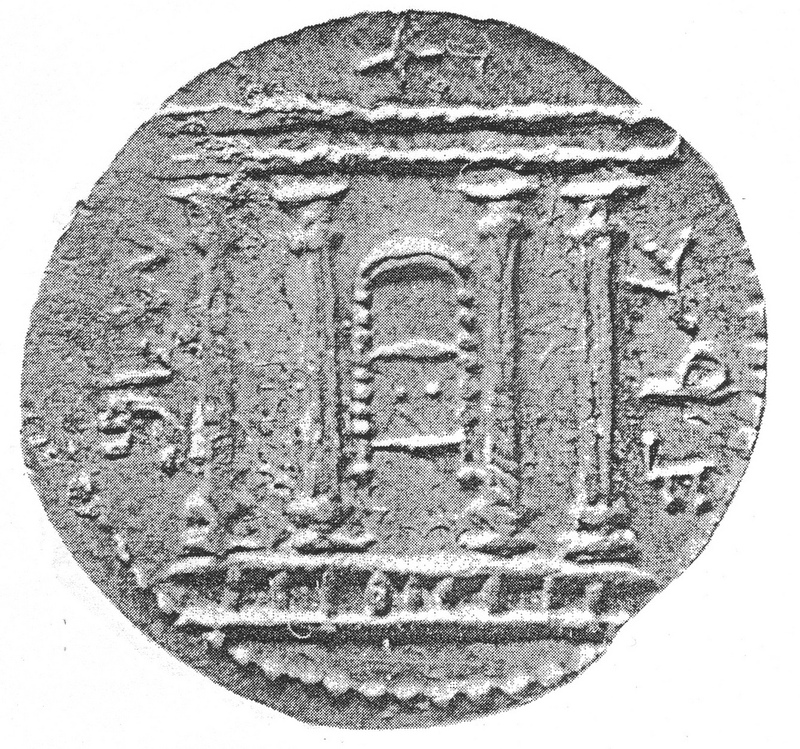 The first schematic representation of the temple in Jerusalem was given on a coin minted during the Jewish Bar Kochba Revolt in 133/134 AD (fig. 154). Fig. 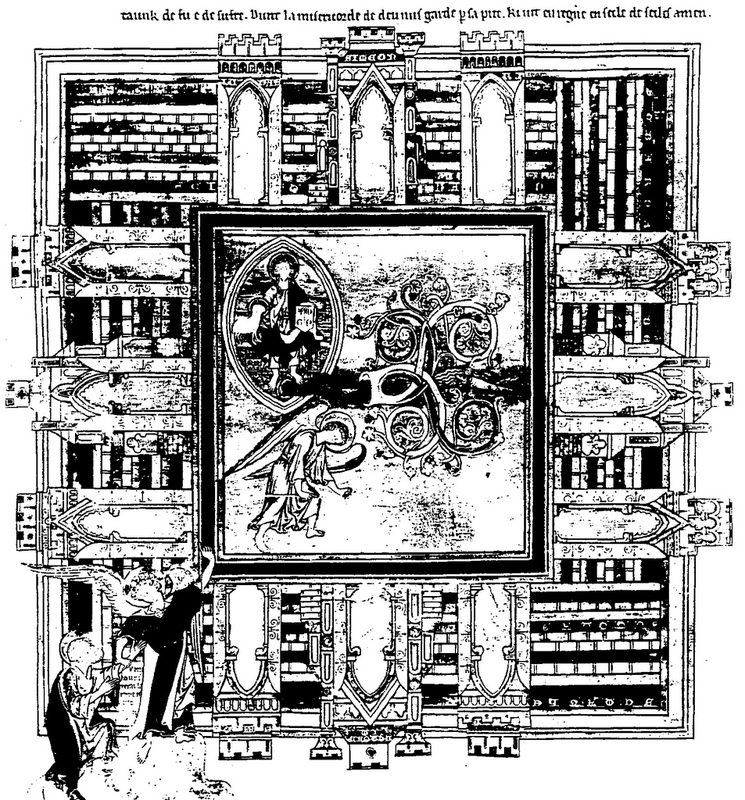 154 – The oldest schematic representation of the temple in Jerusalem. This silver coin was minted during the Revolt of Bar Kochba in 133/134 AD. (Rijkspenningenkabinet in Leiden). This upraising was initially effective, but when the Roman Emperor Hadrian (76 – 138 AD) sent the renowned general Julius Severus from England, its success quickly dwindled. The revolt ended disastrous when the Roman army reconquered Palestine and forced Bar Kochba back into a fortified part of Jerusalem (Betar). The Romans eventually captured the stronghold. The revolutionary Bar Kochba was, according to tradition, not killed by the Romans, but was found strangled by a huge serpent. His name was changed from Bar Kochba (meaning ‘Son of a Star’) into Bar Koziva (‘Son of Deceit’). The symbolic meaning of the four pillars of the temple on the coin of this period remains a guess, but it is unlikely that armed revolutionaries had put their faith into a tetradic world view (with its essential peaceful nature). It might be a reference to the Hellenic temples of the Ionian type, which had reached a state of prominence in the second century BC (see fig. 86), but had since been the blueprint for an archetypal type of temple. Emperor Hadrian, on the other hand, had a staunch interest in everything tetradic, and is – together with his colleague Diocletian (240 – 311 AD) some two hundred years later – a prolific representative of the four-fold attitude in the Roman empirical history. It is more than a coincidence that these two emperors also acted with the most violent vengeance towards the Jewish people. The Temple at Jerusalem figured in history as a point of reference for the Jews, but also for Christianity. The interest started even before the days of European visibility, when the church father Hieronymus (Jerome) wrote his ‘Commentariorum in Ezechielem Prophetam’ in fourteen books between 411 and 414 AD. Pope Gregory I (the Great; 540 – 604), another of the four church fathers, conceived a ‘Homiliarum in Ezechielem’. The book Ezekiel was of special interest to these early searchers of a Catholic truth, because it is the most ‘tetradic’ orientated Bible book. The prophet Ezekiel, writing as a captive in Babylon, had close contact with the Babylonian scientific and religious world and must have been impressed about the possibilities of higher division thinking. The Church fathers, in turn, were still searching and trying to give a form to the Christian message as it had dissipated from the Holy Land in the first centuries AD. The setting of the birth of Christianity was in the Third and Fourth Quadrant (of the Roman cultural period, see fig. 88) and had all the characteristics of such a cultural maturity. The search for the Christian truth – being, in essence, a message of peaceful inter human relationship – took off in a mental environment where all the options were open – which is characteristic of a Fourth Quadrant position. The attention to the fourfold, as advocated by Ezekiel, is a logic continuation in the uncharted territory of early Christianity. The Anglo-Saxon monk Bede (673 – 735), one of the first noticeable Christian-tetradic thinkers of the early Middle Ages, described the temple in his ‘De Templo Salomonis’ and further explanations of Ezekiel were given by Rupert of Deutz (1070 – 1129) and Richard of St. Victor (before 1173). In particular the Crusaders, at the end of the twelfth century, saw the temple as their explicit goal. The prime reason for the Crusades – one of the most curious religious expansion movements, which was only matched by the Muslims in the seventh century – was the liberation of the temple from the ‘infidels’. Further interest for the Temple arose in the fifteenth and sixteenth century of the cultural history of Europe. A greater awareness of the vestiges of Christian history led to a search for new visibility in which the Temple acted as a token of good faith (HERRMANN, 1967). Salomo’s creation became a leitmotiv in architectural history, mainly because the mixture of belief, power and the geometric way of expression came together in its supposedly tetradic setting. The original temple was built between 968 – 961 BC and was destroyed in the year 586 BC by King Nebuchadnezzar of Babylon. Rebuilding took place between 520 – 516 BC. The Temple was again destroyed by the Romans in 70 AD, on the same day of the fifth month as six hundred years earlier. The description of the temple of Salomo – as formally given by the prophet Ezekiel in the Bible book bearing his name (chapter 40) and in the first book of the Kings (chapter 8) – could be pieced together and summerized in some twelve different elements (JETTER, 1987). 1. 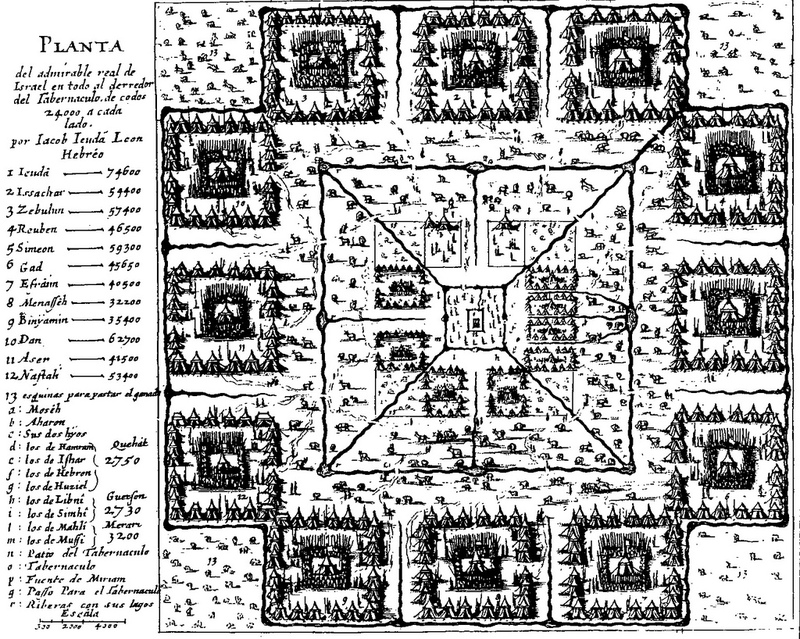 The quadratic ground plan (‘lieth foursquare’). The main entrance is to the east, according to Ezekiel, because that is the direction where the sun rises. Fig. 155 is a reconstruction of the new temple as it was described in the Revelations of St. John around 90 AD (in: QUISPEL, 1979). The Apostle knew that the old temple was destroyed by the Romans some twenty years earlier and dreamed of a return in the future. Fig. 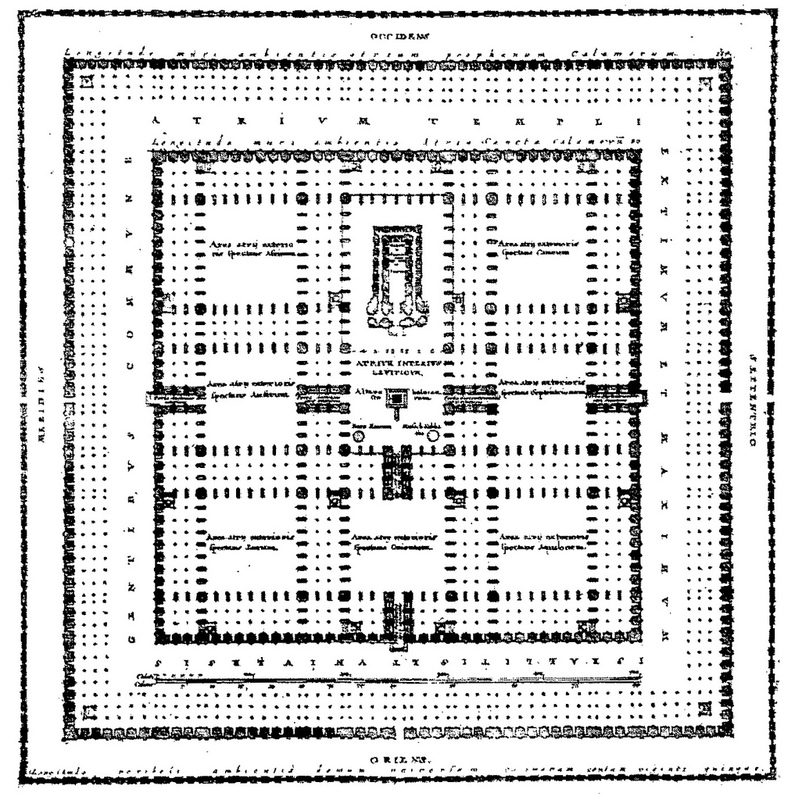 155 – This blueprint for a new, visionary temple is deducted from the descriptions given in the Revelation of St. John (chapter 21). The Roman numbers indicate the major division of the area into four spaces with a hierarchical order of holiness: I. The Holiest of Holy place; II. The Holy place; III. The Offering altar; IV. The Forecourt of the believers; V. The Outer court for the infidels. The New Jerusalem in the medieval manuscript of the Morgan Beatus’ comment on Apocalypse (Piermont Library in New York City, MS 644) showed a checkered field (12 x 12) surrounded by 4 x 3 gates with the twelve apostles and the associated precious stones. Each side has six towers, making up a total of twenty-four towers. The corners of the larger 5 x 5 grid are filled with smaller 4 x 4 grids. Other illustrations in the manuscripts, like ‘Christ with the Evangelist symbols’ and the ‘Victory of the Lamb over the Kings’ (fol. 200) also have a tendency to use the four-division or the symbols related to a tetradic world view. A fresco in the beautiful small church of San Pietro al Monte in Civate (Italy) dated from the first half of the twelfth century and showed Jesus as Pancreator in the middle of Jerusalem (fig. 156). The names of the four virtues are painted at the corners (Fortitudo, Justitia, Prudentia and Temperantia) of the ceiling, while three gates are situated on each of the four sites of the city, identified by the names of precious stones. Fig. 156 – A fresco on the ceiling in the abbey of San Pietro al Monte in Civate (Italy) represents the New Jerusalem as the main city in paradise. Christ Pantocrator sits on a throne on the world globe with a lamb (peace and submission) in front of him. He shows a book with a shortened version of the text ‘SI QUIS SITIT VENIAT’ from the Gospel of Saint John (Chapter 7), meaning that all those who are thirsty can come to Him (a reference to the element of water – identified with a position in the Fourth Quadrant). To the left and right are the two trees of knowledge and the persons in the gates depict the twelve tribes of Israel and/or the twelve apostles. The river flowing from the throne is a reference to the four rivers of Paradise. The Benedictine abbey of San Pietro al Monte dated from 772, but reached its period of maximum splendor in the eleventh and the first half of the twelfth-century. The iconography of the Heavenly Temple in the New Jerusalem and the future Paradise was a mixture of three and four fold imagery, which found its roots in the early days of Christianity. This type of symbolism was particularly suitable for the more ‘invisible’ elements of the Christian faith, drawing the mind from its dualistic-oppositional stance. 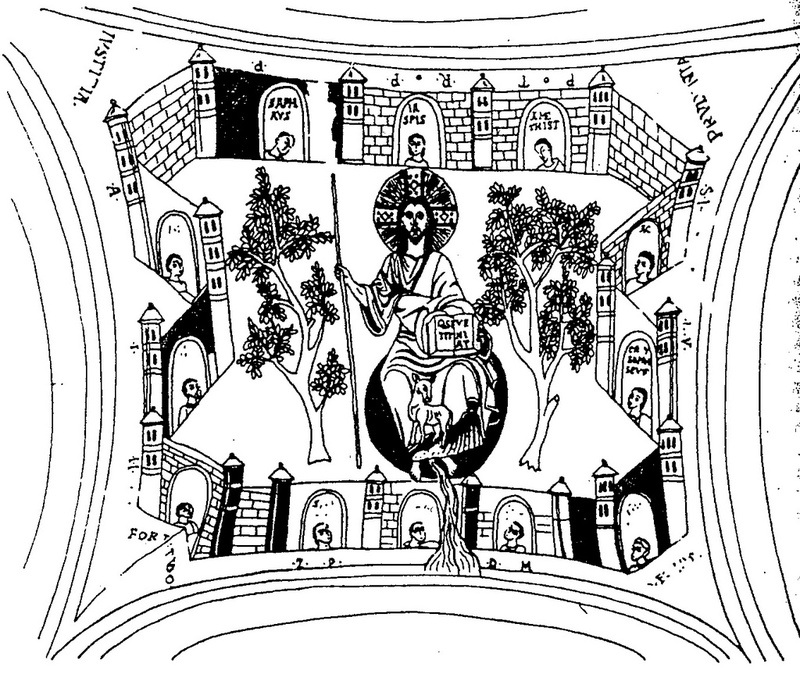 Another illustration of the New Jerusalem – this time from the middle of the thirteenth century and given in a manuscript in Trinity College, Cambridge – follows the same symbolism. 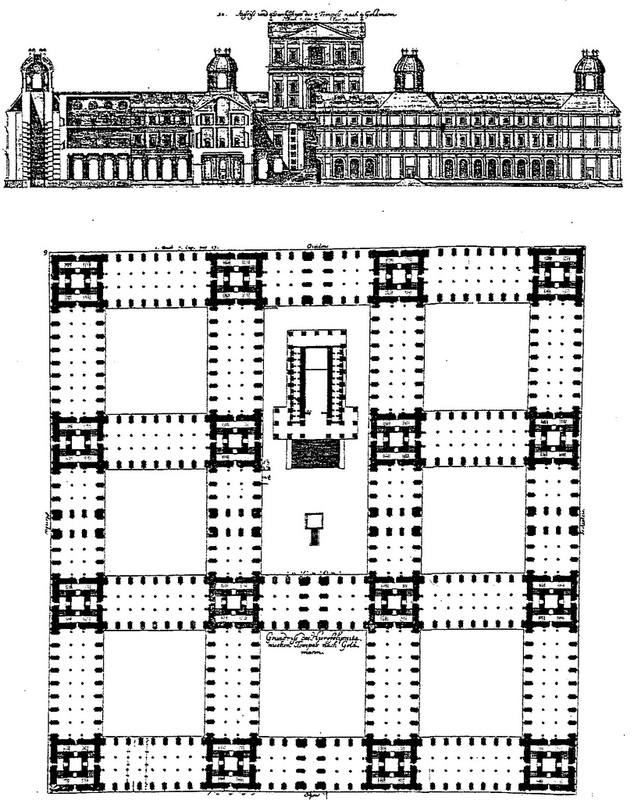 Twelve gates (4 x 3) with towers surround a central square (fig. 157). Fig. 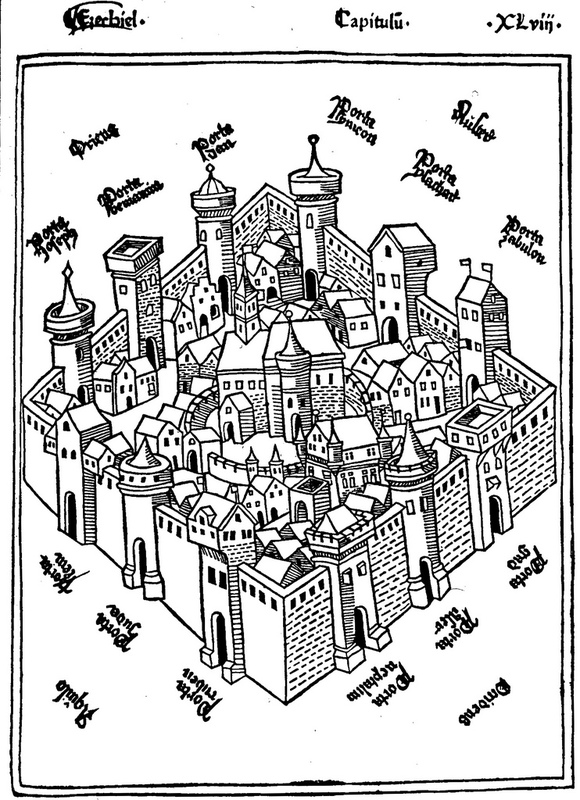 157 – The New Jerusalem is given here as a square city with 4 x 3 gates. The gates have a somewhat ‘Gothic’ appearance in concordance with its date of creation in the middle of the thirteenth century (Trinity College, Cambridge). The plan-like representations of the early Middle Ages became more elaborate from the fourteenth century onwards. In particular the so-called Book of Hours – delicately hand-painted manuscripts with an attention to detail, color and spatial setting – did a great deal to awaken the consciousness of perspective by the observers. Fig. 158 is a recapitulation of that insight in the heydays of the woodcut technicians, just before the printing press was introduced. The meticulous treatment is now abandoned in favor of a new simplicity in order to make mass reproduction possible. The heavenly Jerusalem is depicted here in Nikolaus of Lyra’s ‘Postille’ (fig. 158). It has all the number associations of Ezekiel and the Book of Revelation, with the 3 x 4 = 12 division as the main characteristic. Fig. 158 – This representation of the City of Jerusalem is given in Nikolaus of Lyra’s ‘Postille’, printed by Ulrich Zell in Cologne in 1485. Hartmann Schedel (1440 – 1514) provided an important visualization of the Temple in Jerusalem in his ‘Liber chronicarum’ – also known as the ‘Schedelsche Welt Chronik’ (fig. 159). He issued the book in July 1493 on the printing press of Johann Gutenberg in Nuremberg. Some eight hundred copies of the Latin edition and four hundred of the German editions have been traced. The ‘Nuremberg Chronicle’ became one of the most popular incunables. The mixture of sacred and profane history and a large number of woodcut illustrations must have contributed to this success. Masters like Michael Wolgemut and Hans Pleydenwurff produced most of the maps and double-page city views to enhance the history of the world. The book is inspired by a devotion to the Part (or Fact). The division of the work in six ages points to a numerological approach, possibly inspired by oppositional and/or three-fold thinking. Schedel’s Jerusalem (Blatt 67a) has three gates in the outer wall and three gates in the inner wall, bringing the total to six (rather than twelve). There is a distinct axial symmetry and the observer is guided along this line towards the holiest part of the Temple. 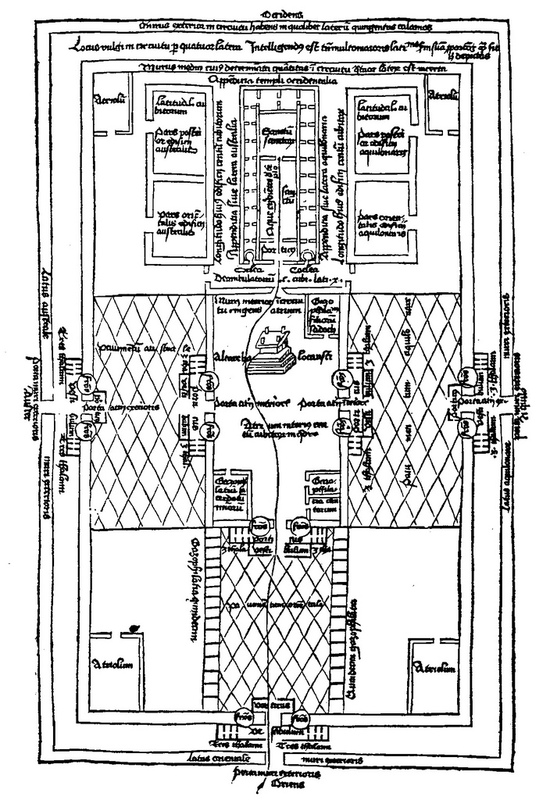 Fig 159 – The Temple in Jerusalem, as given by Hartmann Schedel in his ‘Weltchronik’ in 1493, has a reduced number of gates (six) and favors an axial (two-fold) symmetry. The Jesuit priest Juan Batista Villalpanda (1552 – 1608) continued the tradition of the depiction of the New Jerusalem some hundred years later in a commentary on Ezekiel (In Ezechielem explanationes; Rome, 1596). He regarded architecture as a given activity under a direct divine authority, resulting in an architecture of grace (RYKWERT, 1972). The proportions of the Temple were based, in his post-Renaissance view, on the perfect human body, which is the body of the Savior (fig. 160). Fig. 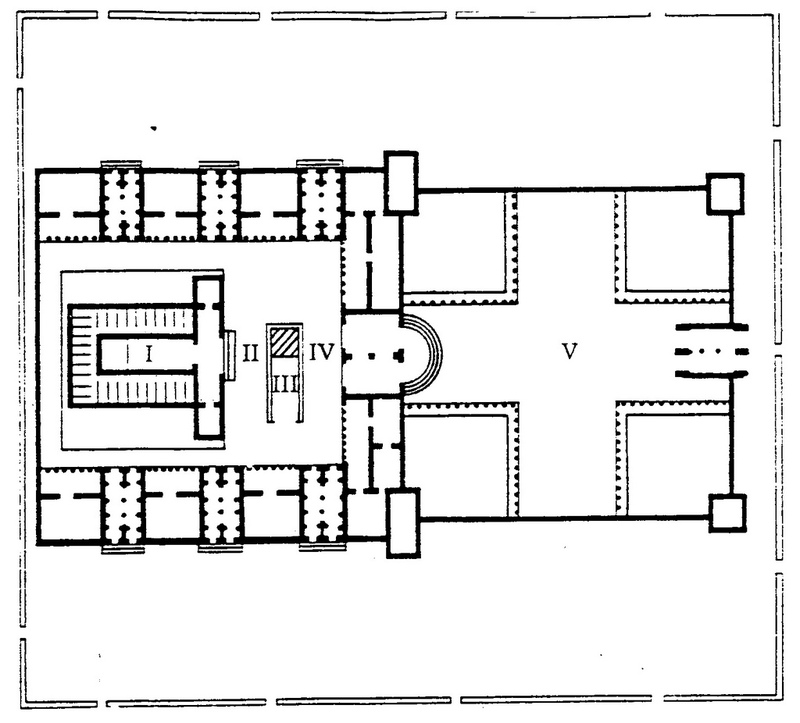 160 – This plan of Solomon’s Temple by Juan Batista Villalpando in his book ‘In Ezechielem explanationes’ (volume II, 1604) was accepted as a proper representation of the historical Temple up to the nineteenth century. The massive, three-parted book was written in Rome and sponsored by King Philip II of Spain. The popularity of the plan was enhanced by its occurrence in the ‘Biblia Polygotta’ (1657). Christopher Plantin’s (1514 – 1569) eight-volume polyglot Bible in Aramaic, Greek, Hebrew, Latin, and Syrica gave him little profit, but the Holy See and King Philip II (of Spain) designated him as the official printer of liturgical books for Spain and the Netherlands in 1579. Villalpando’s tetradic design remained a guideline for the times to come. Another Spanish ecclesiastic, Juan Caramuel Lobkowitz (1606 – 1682), used it in his ‘Templum Solomis in Jerusalem, Rectam et Obliquam exhibens’ and Nikolaus Goldmann’s drawing (1665/1696) followed the same lines (fig. 161). The Austrian architect and artist Johann Fischer Von Erlach (1656 – 1723) made a virtual copy of Villalpando’s design in 1721. Fig. 161 – The Temple in Jerusalem by Nicolaus Goldmann, 1696. The drawing was completed before 1665 and showed an even stronger tetradic design than the one of J.B. Villalpando. The middle of the seventeenth century is identified in the European history as a period of an acute awareness of duality, resulting not only in times of conflict and rebellion, but also in the great discoveries of Galileo and Newton. The tetradic iconography of the New Jerusalem, with its associated themes of a square city with four times three gates, twelve tribes/apostles and a collection of twelve precious stones remained virtually unaltered throughout the ages. The conclusion can be drawn that higher division thinking often influenced the eschatological visualization of the city of Jerusalem. The temple, as a symbol of (Jewish and Christian) faith, was full of meaning at the very moment when a craftsman or artist wanted to express its physical presence. The division-consciousness sometimes ran into obvious forms of numerology, but that seemed to be par of the course.